I was starting to wonder whether the trip was worth the hassle, money, and stress. To reduce driving we decided to give up our original intention of exploring the extreme southwest (which neither of us has ever visited), and to delete revisiting our favorite places in Normandy in the northeast. We all know what coastal towns can be like in tourist season, and the Southwest promised to be too hot for comfort. Happily out of Monpazier we retraced the road north, stopping in a sweet little town, Mouleydier, on the railroad line, for an excellent rabbit and vegetables lunch in Bon Coin Brasserie. Bergerac's old town was just more tourist hordes. We thought of Monbazillac, and drove up the steep hills to check it out, but there were no hotels--just gorgeous vineyards all directions. 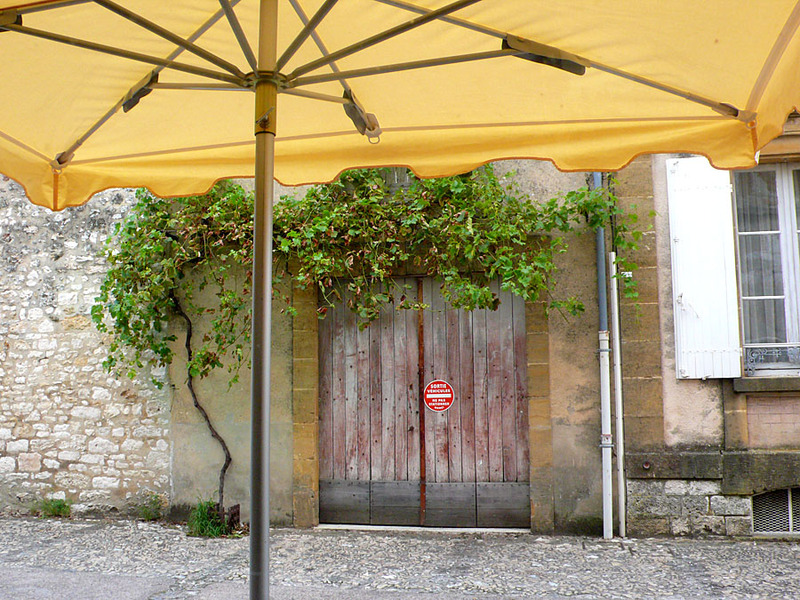 Villeneuve-sur-Lot had only three glum hotels by the train station, so we just headed with vague hope in the general direction of Cahors, a city we both like, but we were worried that arriving after 6:00 pm would force us to take less than pleasant lodging. F. had the excellent idea to try a stop at one of the oft-advertised chambres d'hôtes. The little signs pop up everywhere, and I pictured a gruff French farmer's dinner being interrupted by a guy speaking marginal French, and then our being shown a squalid, hot, mosquito-infested room up the stairs with stencilled wall decorations. Not so! We drove up a small one-lane road to a large entryway with signage: "Fontaine des Oiseaux", turned left towards the huge stone barn and horses, past the geese, to find a clean swimming pool shimmering beside an even larger and immaculate stone farmhouse. A British couple greeted us (well, she did, in French, and we had bumped along for a few minutes before it became clear to all of us that English was our first language). An enormous suite was available at a very modest price on the second floor--completely private, and the price included breakfast. Sold! F. and I walked the acres of grounds, petted the dogs, talked to the birds, then drove into a nearby village for a good Italian dinner. The sitting room had wide-screen TV and several English language channels, including CNN. A very fortunate stop.